Sure, the purely visual elements of your newly designed website will likely get the most attention, but remember: a great website redesign also requires that you consider (and improve) what’s under the hood. In this guide, we’ll cover one particular portion of the less glamorous side of website redesigns: search engine optimization. 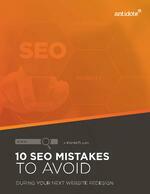 Learn the other seven mistakes to avoid by filling out the form for our free white paper white paper on the right!